Derrick Parsons, CIC, is a native of Hopkinton IA. He graduated from the University of Northern Iowa with a degree in Family Services. Derrick joined English Insurance Agency in 2014, specializing in personal, business, property, and life and health insurance. He received personal, property and casualty, and life and health state insurance licenses in 2014. He earned the Certified Insurance Counselor (CIC) designation in April 2018. This is nationally recognized as an important credential for insurance agents, benefiting his agency and clients. 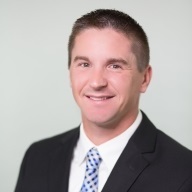 Derrick currently serves on the Young Agents Committee with the Independent Insurance Agents of Iowa, as well as a committee member on the MercyOne Health Foundation Board, Dyersville Young Professionals Group, and St. Francis Xavier Parish Council. Derrick has past experience in coaching high school baseball at Maquoketa Valley and high school football at Cascade High School. Derrick is married to his wife Miki, and they have three children, Jaxson, Adrianne, and Bo. In his free time, Derrick enjoys attending Iowa Hawkeye football games, traveling, and spending time with his family and friends.